In many years of following leopards hunting at Londolozi, in the Luangwa Valley and in the Masai Mara, I came to the conclusion that no two leopards hunt the same. A young leopard builds on its experience as it matures. Where it is successful, it re-enacts the hunting technique time and again, refining its methods. Where it has experienced failure, it cuts out these techniques, saving its energy for more rewarding opportunities. Often injury causes a leopard to completely abandon one strategy. I saw leopards that had a bad experience with warthog, completely refrain from hunting them. Other leopards were happy to take the risk and sometimes reaped the rewards. 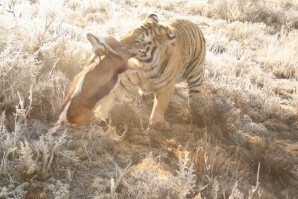 I believe tigers are similar in their hunting style and their ability to learn. In over three hundred hunts, I never saw Ron & Julie co-operate in the hunt. Only in hunting ostrich, did they co-operate, often herding the ostrich towards the fence and trapping them against it. All other species were hunted individually. They encounter a porcupine. Shadow gets a quill right through her left paw. I consider darting her to remove the quill, but she pulls it right thru the paw with her teeth. She recovers completely. The porcupine gets away. A hard lesson learnt. A large tortoise is killed and eaten. I presume it is Seatao, as Shadow's jaws would not be strong enough. Ron successfully killed and ate many large tortoises which abound at Tiger Canyons. I have never seen Julie crush one. I have seen lions struggle to crush tortoises of a much smaller size, but have seen hyenas successfully crush them. I presume it must be something to do with the pressure the jaws can exert. 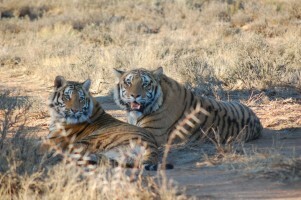 An interesting experiment would be to compare lion, hyena and tigers jaw pressure. Whereas the porcupine has been a negative experience, the tortoise has been positive. The tigers will build on this. Nothing that I can find. An antbear is killed. From the tracks, it appears they caught it while it was foraging. Previously, I had placed warthogs down burrows for a young lioness called Shingalana that I had raised. Later I had filmed her pull a big warthog from its burrow. The association between the burrow and potential food had been made. Would the tigers learn to dig antbears from the burrows? If so, it's a very nice size kill and can tide them over between the big kills. Despite blesbuck, springbuck, ostrich and steenbuck in the hunting area, no antelope had been captured. Had I designed my hunting area with too little cover for the tigers? On the north side is a magnificent wetland with tall elephant grass and many swimming pools. On the south side, is short grass with low bushes, not that easy for a large bodied cat like a tiger to stalk in. 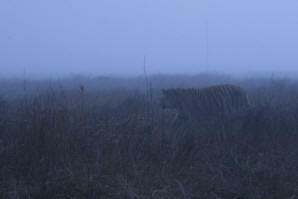 Tiger Canyons is covered in mist, the temperature is -1°C as I search for Shadow and Seatao at sunrise. Thru the mist, I see a single springbuck grazing away from the herd. It will prove to be a fatal error. It will take several minutes before I see a tiger crouched behind a low bush. It is Seatao. His striped coat breaks up the outline of his body as he merges into the bush. Between him and the springbuck, there is no cover in which to get closer. I have seen cheetah, lion and leopard all use rain to their advantage when stalking. Never mist. Seatao's forward facing eyes never leave the feeding springbuck. He does not even turn his head to glance at me. The slightest movement could give him away. His concentration is intense. For such a young tiger, his patience is impressive. We wait for 20 minutes. The only movement is the springbuck which grazes unconcernedly, lifting its head occasionally. Then Shadow arrives. Her soft pads bring her silently to the scene. Quickly she sums up the situation. She backtracks behind my jeep, effectively using the jeep as a shield. She moves down a dry river bed, she is able unseen to get into a position closer to the springbuck than Seatao. Every time the springbuck lifts its head, Shadow freezes. Effectively, she has placed herself in a position where with the jeep and Seatao, the springbuck is completely surrounded. These are super predators, inexperienced yes, but highly intelligent, showing all the ingredients that will one day make them highly efficient hunters. From less than 12 paces Shadow makes her run. The springbuck has no chance. If it runs north, it runs into Seatao, if it runs south, it runs into my jeep. The next 20 minutes prove fascinating. There is no quick suffocating bite to the throat. This is still to be learned. They jump around the springbuck like two kids with a new toy. They maul and bat the unfortunate springbuck. Finally and mercifully Seatao grabs it by the throat and kills it. I am surprised, normally females are quicker to learn and I would have thought Shadow would have killed it. However, she observed Seatao killing it. The next 20 minutes are equally as fascinating. They appear to be celebrating. They take it in turns to romp, play and roll with the dead springbuck. Through the grass and into the water. Clearly there is joy and celebration. I have seen this exact behavior with young lions in the Masai Mara. An hour later, Seatao and Shadow began to feed. I had seen Seatao and Shadow co-operate in a hunt, something I had never seen Ron and Julie do. 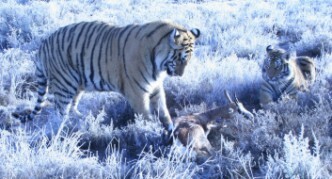 For the conditions and the circumstances and the prey available, it may be that co-operative hunting will be more successful than individual hunting or they may also do both. Like leopards they will build on what proves to be successful for them. Inside my specially designed caged vehicle, I too am celebrating. 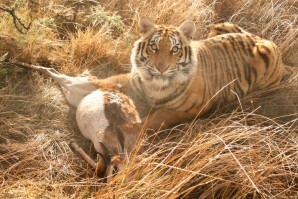 I have just filmed two young tigers successfully hunt a fleet-footed springbuck. I liken Shadow and Seatao's first kill to watching my kids score their first goal in soccer or runs in a cricket game, or win a tennis match. I had acquired Seatao and Shadow at 6 weeks old. Now they were free and hunting on their own. I was proud as could be. At time of writing, they have been hunting for 23 days and have captured no less than 6 Blesbuck. I am now in a good position to assess the "hands on method" we employed with Ron and Julie with the "hands off" method used with Seatao and Shadow and I'll bring you this in the next newsletter.